The progress Mattie has made cognitively the past 6 months is so significant I sometimes can’t even believe it myself. Mattie was not even talking last November. She finally passed her hearing test in December (on my birthday) and has made so much progress. She has at least 50 words she uses along with 20 signs she still uses. I can almost breathe a sigh of relief knowing that she is progressing cognitively. We are still asking her to answer for everything rather then assume we know what she wants. She will respond with a “yea” or “no” but as of this week is finally using the word Yes. We finally received our “GAP Insurance Exception” for speech therapy which means the price is now $20 a session. So as of a few weeks ago Mattie is doing speech therapy 1x week. I am happy about adding speech back into our program. In just the few weeks we have been having speech therapy, Mattie’s speech has already improved. Mattie continues to see her OT once a week as well as her EI (early interventionist). 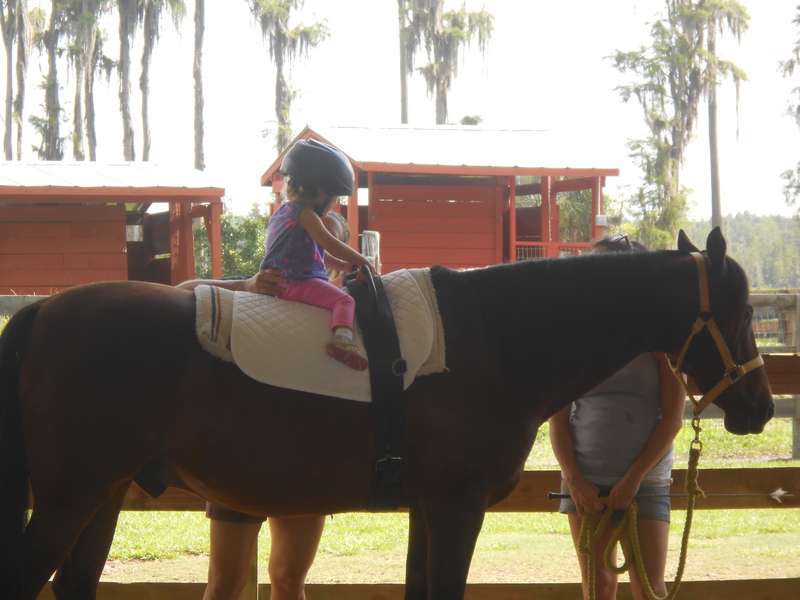 A few weeks ago we had our consult with hippotherpay, which is a type of PT done on a horse. Riding a horse imitates the same movement we have for walking. 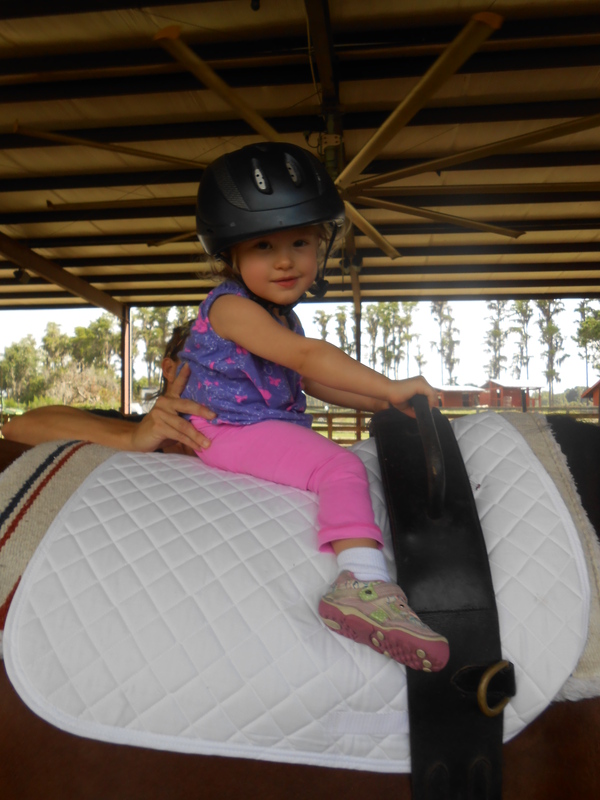 We have been waiting for Mattie to turn 2 to try this type of therapy out. I will say that Mattie looked really good on the horse. She was sitting up much taller than I thought she would. The PT in charge of the program thinks Mattie will do really well so we are going to be adding this to her program once a week. I am hoping that Mattie will gain some balance and improve her core muscles. Sarah, Mattie’s amazing nanny, still does our home program each day with her along with these “extras”. During the day they work on reaching, sitting criss-cross, side sitting, using a spoon/fork, speech/language, puzzles, sorting, and the list goes on and on. As most of you guys know, Mattie started to Army crawl after our trip to California to the main ABM Center. We just completed 13 sessons of ABM in the past 3 weeks (between Gainesville and NYC). Mattie is starting to use her knees and legs while crawling, it still isn’t a perfect crawl but progress is progress and I will take it!! With so much time dedicated to Mattie, life is just going by in a blur these days. I feel like we never stop. We never do stop which is probably why I feel that way. As soon as we are back from an ABM trip, there is something else looming the following weekend. I just told my mom that I am booked until August. How ridiculous is that?!? I keep telling myself the progress Mattie is making is worth it all, but sometimes I feel like at what cost? Will Joba regret traveling around for Mattie, always on her schedule instead of having fun weekends? Will Jim be resentful because I only have so much of myself to give and sometimes there is nothing left for him? Will Mattie ever have a “normal” childhood that does not revolve around therapy appts and the next “best thing” to get her to move? How do we do it all and still enjoy it??? As the days and months pass, Mattie continues to show us what determination and persistence can achieve, and in that, I find my strength, hope, and resolve that it can all be done with mostly smiles on our faces.